The ladies Flat season drew to its customary close at Newbury on Saturday with a media frenzy around Olympic cyclist Victoria Pendleton having only her third ride under Rules and bookmakers incredulously making her mount Satanic Beat favourite. Followers of the Ladies Amateur Flat Championship were however concentrating on Joanna Mason‘s last ride of the season whilst she remained alongside Serena Brotherton top of the tables on 6 wins each, but Serena without a ride. Such is the success of Serena’s career on the Flat that she has enjoyed the ladies championship an incredible previous 7 times (2005, 2006, 2009, 2010, 2011, 2012, 2014) and now enjoys her 8th championship. Serena also won outside the ladies championship this summer, victorious when representing Great Britain in the ladies international race at Carlisle on their Ultimate Ladies Night in early August and also in France in September during a lull in the ladies calendar. Joanna’s story for 2015 is extraordinary, having broken her back point-to-pointing in March this year which necessitated her having 8 pins and 2 steel rods inserted into her back. 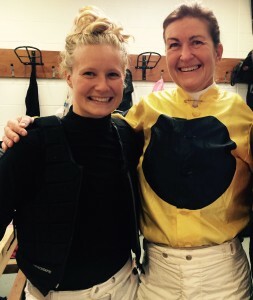 Jo displayed huge grit and determination pushing herself hard physically, successfully showing her regular partner LIVERPOOL whilst she recuperated, and was passed fit to return to race riding by the BHA at the end of June! As the ladies season progressed, both Serena and Jo forged ahead of their competitors and gave a real edge to the battle for the championship with a ding-dong battle at the top of the tables. An added twist was Jo picking up a 4-day ban at Brighton which consequently stopped her riding in 3 races but Serena did not ride in the final 3 of the season, leaving herself vulnerable until the finale. Huge congratulations Jo on not only your first ladies championship but also on overcoming so much adversity, and many congratulations also to Serena on another amazing season! Yorkshire must be very proud of you both!